K Ramesh has done B Sc in Zoology and M Sc in Wildlife Biology from ABC College, Tamil Nadu. Post that he did Ph D in Environment Management from FRI & WII. 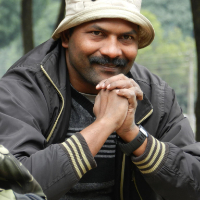 He joined Wildlife Institute of India (WII) in 1995 and studied species in Great Himalayan Park. He became a faculty member at WII in 2008. Three of his major activities are Landscape Ecology, Species Recovery Strategies & Integration Technology in Wildlife Research & Management. He is also leading an important project for introduction of tigers in Central India and Madhya Pradesh. He is a Scientist at Wildlife Institute of India. Natural resource management refers to the management of natural resources such as land, water, soil, plants and animals, with a particular focus on how management affects the quality of life for both present and future generations. "I have a Master's degree in Wildlife Biology from AVC College (Bharathidasan University), Tamil Nadu and a Ph D degree in Forest Ecology and Environment from Wildlife Institute of India (a Research Center of Forest Research Institute University, Dehradun). I have been working with WII since 1995; earlier as Research Fellow and joined the faculty in 2008. Prior to joining the faculty, I was with the World Pheasant Association-UK as a Post Doctoral Fellow for four years (2005-2008), undertaking a collaborative research project with WII on pheasants and partridges in northwest India. My professional interests include Landscape Ecology, Remote Sensing and GIS, Quantitative Methods, Species Distribution Models, Biostatistics, Radio-Telemetry, Wildlife Population Estimation and Monitoring. I have research and conservation experiences on birds and mammals of the Western Himalaya, Shivalik-Terai Landscape and Central India. Presently involved in diversity of projects that include Reintroduction and Monitoring of Tiger Population in Panna Tiger Reserve (Madhya Pradesh), Conservation Breeding and Reintroduction of Western Tragopan in Himachal Pradesh, Application of Wireless Sensor Networks for Forest and People Protection, Integration UAV (Drone) for wildlife research and management, and Climate Change Effects on Riverine Forests and Indicator Species along the Ganges. I have been a member of IUCN/SSC/Galliformes Specialist Group, International Association for Landscape Ecology, International Society for Restoration Ecology, etc. In addition to Gold Medal for my Graduation as well as Post-Graduation Courses, I received prestigious Distinguished Foreign Scholar Award by the US Regional Association of the International Association for Landscape Ecology and NASA-MSU Professional Enhancement Award by National Aeronautics and Space Administration, and Michigan State University, USA. I have traveled widely and am interested in sports."